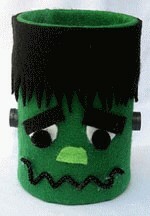 Make this darling little Frankenstein out of felt, glue and a tin can. Fill him with lollipops for Halloween or use as a pencil holder for your homework desk! Let him dry before filling with candy or pencils. Author Amanda Formaro is the entrepreneurial mother of four children. She is also the Chief Editor and Craft Expert of FamilyCorner.com Magazine.